It’s part one of ‘funky Latin stuff comes from the unlikeliest places night’ here at MB and so it is that the monkey brings you news of the Big Crown label’s signing of Bobby Oroza – born in Finland, the Latin appearance of the name notwithstanding. 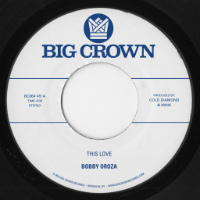 Turns out Oroza’s new single This Love Pt 1 – a hot-buttered slice of woozy lowrider soul – is at the pressing plant and the B-side is a big secret for now. Could it be an instrumental cut called This Love Pt. 2? You’ll just have to wait and find out. Until then, the summery Latin soul haze of This Love Pt 1 will have to be enough for you as Oroza lullabies you with his occasionally falsetto croon. An album follows later in the year.